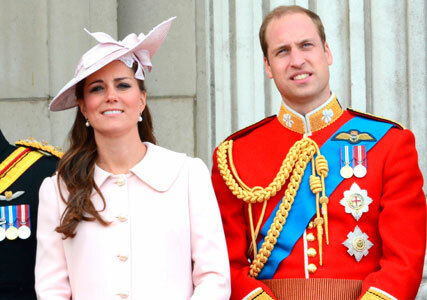 Kate Middleton made her final public appearance at the Queen’s Trooping the Colour ceremony on Saturday, wearing a stunning pastel pink Alexander McQueen coat. The heavily-pregnant Duchess of Cambridge graced the balcony of Buckingham Palace with Prince William, Prince Harry and the rest of the royal family for her final engagement before the birth of her first child, which is due next month. Trooping the Colour is carried out by fully-trained and operational troops from the Household Division on Horse Guards Parade in Whitehall and dates back to the early eighteenth century. The Queen was greeted by a royal salute before carrying out her inspection of the troops. She then took her place on the balcony with her family to watch a fly-past by the Royal Air Force. Prince Phillip remained in hospital over the weekend, where he’s recovering from abdominal surgery. It’s thought to be only the third time he’s missed the event. Kate Middleton looked radiant in a pale pink Alexander McQueen coat, teamed with a matching pink lace hate by Jane Corbett, which she wore to a Diamond Jubilee garden party in May last year. She shared a carriage with Prince Harry and the Duchess of Cornwall and was seen sharing a giggle with the pair as she waved to well-wishers. 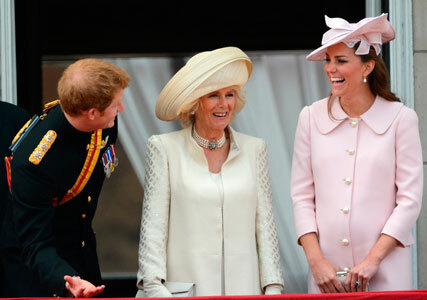 The coat Kate chose for her final pregnancy parade featured oversized pearl buttons and a gorgeous Peter Pan collar, and we could just about get a glimpse of her huge baby bump when she turned to the side to speak to her relatives. She carried a silver Alexander McQueen clutch bag which had the skull clasp detail removed.